Welcome to Vol. 5 Iss. 2 of the VOX-Pol Newsletter. This is VOX-Pol’s fifth year in operation; thank you for your continued support over the last four years. If you have colleagues, friends or anyone who may be interested in the content of our newsletter, or any events or research carried out by VOX-Pol, please forward this to them and encourage them to subscribe via our website. In particular, please update any interested colleagues about our two-day conference on 20 – 21 August at the University of Amsterdam, with post-conference workshops on 22 August. Follow us on Twitter @VOX_Pol for live updates and releases. The Third Biennial VOX-Pol Conference will be taking place in Amsterdam on 20 – 21 August, with Post-Conference Workshops on 22 August. 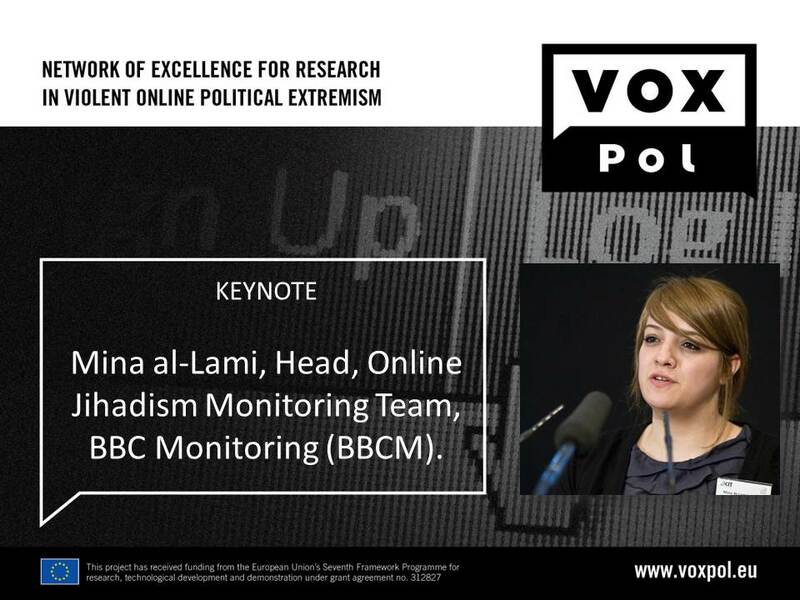 We are delighted to announce Mina al-Lami of BBC Monitoring as the Key Note Speaker. You can register HERE . To get a feel for past conferences, check out the programmes, keynotes, workshops, etc., for our 2016 conference at Dublin City University HERE and our 2014 conference at King’s College London HERE . VOX-Pol recently held a two-day workshop titled ‘Combating Online Extremism: State, Private Sector, and Civil Society Responses’ at the University of Oxford on 10 – 11 May 2018. The workshop sought to explore the emerging responses from politicians, think tanks, technology companies, and civil society to the proliferation of extremism and hate online. It featured several discussions across the board with a view to evaluating approaches to combating online extremism, as well as its implications for governance. For more details, visit HERE. On 4 – 7 April, VOX-Pol researchers participated in the International Studies Association (ISA) Annual Convention, in San Francisco, California. Whilst topics covered at the conference were wide-ranging, there were a large number of panels focusing on terrorism and political violence. VOX-Pol Programme Manager Lisa McInerney, VOX-Pol Coordinator Prof. Maura Conway, along with VOX-Pol and IFSH’s Dr. Daniela Pisoiu and Reem Ahmed participated in various talks and roundtable discussions focusing on terrorism and political violence. The conference aimed to present and discuss new strategies against online terrorist propaganda and radicalisation. One of the primary conclusions drawn from discussions at the conference was that the so-called ‘Islamic State’ is radically changing at present, having lost most of its territory and some of its propaganda production capabilities. Europol’s official press release about the event is available HERE . On 19 April, VOX-Pol, in conjunction with DCU’s Institute for Future Media and Journalism (FuJo), and the National Anti-Bullying Research and Resource Centre launched the HateTrack Tool. The event brought together academics and civil society actors to discuss the issue of racist hate speech in the digital public sphere, with a particular focus on Ireland. You can view the event programme HERE. On 20 February, VOX-Pol released Violent Extremism and Terrorism Online in 2017: The Year in Review ,.This is the second publication in the Year in Review series, following the Year in Review 2016. The report treats developments in the violent extremist and terrorist online scene(s) and responses to them in the 12-month period from 1 December 2016 – 30 November 2017. While the report finds that content production and circulation by the so-called Islamic State was degraded in 2017, it also points to the increased mainstreaming of the extreme right, including online.